A gruesome news swept Japan as "Nevada Girl" showed the world that being cute is not all that good. 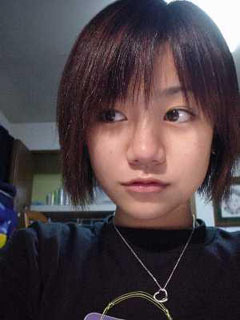 Unnamed 11-year-old girl who murdered her classmate, 12-year-old Satomi Mitarai on 1 June 2004. Both girls were sixth-graders at the Okubo Elementary School in Sasebo, Nagasaki Prefecture, Japan. During their lunch period, the younger girl lured Mitarai to an empty classroom and slit her throat with a box cutter. Covered in blood, the girl returned to her classroom at the start of afternoon classes and told her teacher to call an ambulance. She confessed to the murder after leading her teacher to the dead girl's body. The girl argued that Miterai had insulted her appearance on a web-based forum, Miterai calling her a "burikko" (a pretentious cutie) and "heavy", provoking a heated online dispute between the two. "She wrote something bad about my appearance several times on the net a few days before the incident. I didn't like that, so I called her [to a study room] and slashed her neck after getting her to sit on a chair." Japanese laws prohibit the trying of children under the age of 14 as adults; accordingly, the killer has not named. The only photograph of her that was initially released showed her wearing a sweatshirt printed with the word "NEVADA". Since the murder, the girl has attained a following on some anime forums, referred to as the "Nevada Girl". Wonder if this could happen in the Philippines.